Update: If you live in the US, you can now use the Apple Watch Series 4's ECG feature. Rumors suggest the company will be launching the feature in Europe (including the UK) in the next couple of weeks as part of watchOS 5.2. If you're looking for something different from Apple in the smartwatch space, then you've got it now: the Apple Watch 4 has as an upgraded design and display, with the intent of making one of the most popular timepieces in the world more desirable. The larger screen and more rounded edges are much nicer to look at and offer more functionality, and it also adds in some extra features too that are designed for those who are a little more vulnerable or suffer certain health conditions. If you’re on the original Apple Watch or even the Series 2 model, you’re probably thinking that it’s time to get something new on your arm - and Apple’s recognized that with the decision to change things up. The Apple Watch 4 is still one of the more expensive smartwatches out there, but it’s also the most popular (according to Apple) - so what do the new features bring and are they really worth the upgrade? The Apple Watch 4 is available in four variants: 40mm and 44mm sizes, and with or without LTE. In terms of the Apple Watch 4 release date, you can buy it now in almost every country around the world. It came out in September 2018 on the same day as the iPhone XS and iPhone XS Max. If you're looking for a contract with the LTE watch, you'll be looking at carriers like AT&T, Verizon, Sprint and T-Mobile in the US. 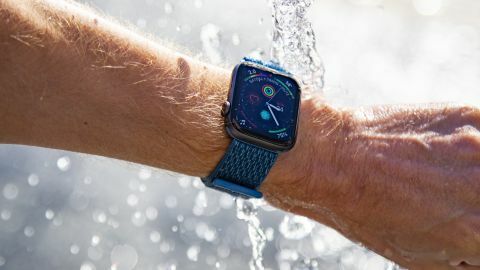 If you’re in the UK, EE offers deals for the LTE version of the watch as it did for the Apple Watch 3, and Vodafone has joined the party with the Watch 4 by offering a data connection too. The Apple Watch 4's key feature is really its design - we say that because while the extra health benefits are something that are worthy and really make this an attractive device for those in need of them, the pool of people this is relevant to is smaller than just those looking for a new watch. We're also not able to test some of the key new health features - specifically the electro-cardiogram feature (ECG) that has so far only been enabled in the US. WatchOS 5.1.2 brought the ECG feature to those in the US late in 2019, but it's still unclear when it'll be launching around the rest of the world. We've yet to test it out ourselves - we hope to soon - however, we were able to see it in action during our demonstration from Apple, where you need to activate the app on the phone and then hold the Digital Crown down to complete the electrical circuit in your body. This spits out a set of data from the ECG to your Health app on the iPhone, which can be exported as a PDF and give information on rhythm to a physician, plus you're able to write notes to contextualize what was happening at the same time. The other thing we weren't able to really test was the new fall detection, as you have to go down a certain way and remain there for a while to activate the feature. We did try to fall, but it was getting a little embarrassing and perhaps we need to commit harder to the testing - we'll update the review if we get braver in the coming months. However, one thing that did worry us a little about this feature is battery life - while it's great to see that fall detection exists, and will be set up automatically for those over 65, the fact that you really need to charge the iPhone once a day is going to be harder to remember for some users and that could mean their safety blanket (or for those that bought the Watch 4 in the first place to safeguard a loved one) is redundant if the Watch has no power. There's also a set of heart rate notifications, including one that's looking out for atrial fibrillation (AF), meaning you'll get a pop-up if there's anything that looks sketchy with your heart with regards to this condition, which could lead to life-threatening complications. The Watch 4 also comes with an alert system if your heart rate goes too low or high: should your heart rate spike or fall hard for no reason for a long enough period (around 10 minutes) you'll get an alert telling you all is not well, and maybe your should see a physician. We have a rather low heart rate from regular running training, and the update did ping in from time to time to reference to us that the heart rate testing was working. The other key upgrade beyond the design, which we'll get onto in a minute, is more hidden in the heart of the Apple Watch 4 - there are sweet touches like a (virtually) clicking Digital Crown that feels like it's clocking through lists on the wrist. It even makes a slight noise, and the whole system is incredibly pleasing.